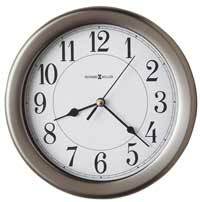 The Howard Miller Chaz 625-614 Contemporary Wall Clock is finished in a Satin Silver on select hardwoods and veneers. This clock features insert mirror panels accenting the fixed front frame. The white dial has polished chrome bar hour markers and hands. The rectangle cut-out reveals a polished chrome-finished pendulum bob. The Chaz features a accurate Quartz, battery-operated, single-chime movement that plays the Westminster chime on the hour and counts the hour. It also features Automatic nighttime chime shut-off. Requires four AA sized batteries (not included). 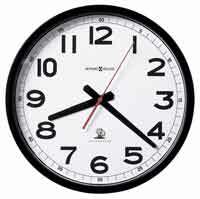 Clocks for sale at The Clock Depot including the 625-614 at discount prices.